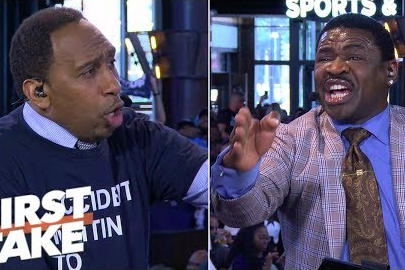 Stephen A. Smith and Michael Irvin debate on "First Take" on Nov. 5, 2018. The NFC East is completely up for grabs halfway through the 2018-19 NFL season — and that can only mean two things. One, the Eagles are going to win it. Two, every other team except the Giants is going to yap about their rise to glory for the next two months. With the Cowboys scheduled to face the Titans on "Monday Night Football," ESPN's "First Take" was at AT&T Stadium to discuss whether Dallas has what it takes. Former Philadelphia beat writer Stephen A. Smith is often reserved in his praise for local teams, but today's show made it abundantly clear that his ridicule for the Cowboys knows no bounds. Even Michael Irvin, who appeared on the show to announce the resurrection of his largely irrelevant former team, could not out-yell Smith. "Y'all ain't nothing!" said Smith, who wore a Cowboys-colored shirt with the phrase, "Accident Waiting to Happen." "Ya'll ain't been nothing! The last time y'all was something, you had an afro!" The one statistic Eagles fans might want to consider is that the NFC East hasn't had a repeat winner since 2003-2004. It was the Eagles back then, so it would be fitting for them to pick up where they left off in 2018. Dallas may be playing a game Monday night, but Stephen A. Smith did a fine job of kicking off Cowboys week in Philadelphia.